M.Sc. in Physics/Chemistry/Materials Science with a minimum of 55% marks. For SC/ST candidates, a minimum of 50% marks is required. M.Tech. in Materials Engineering with a minimum of 55% marks. For SC/ST candidates, a minimum of 50% marks is required. Eligible candidates may send their application (Max. 2 A4 pages) including educational qualifications, experience, any other information and contact details, by email to either vvsssse.uoh@nic.in or vvsssse@gmail.com on or before 30 Apr 2019. 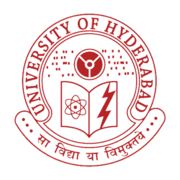 University of Hyderabad Recruitment 2019 - Job notification for Project Assistant Post on a project entitled “Development of Polymeric Binder with Enhanced Burn Rate” in University of Hyderabad, Hyderabad, Telangana on Temporary Basis. Applications are invited by University of Hyderabad on or before 20 Apr 2019 for 1 vacancy. University of Hyderabad Recruitment 2019 - Job notification for Senior Scientist Post in University of Hyderabad, Telangana. Applications are invited by University of Hyderabad on or before 20 Apr 2019 for 1 vacancy.